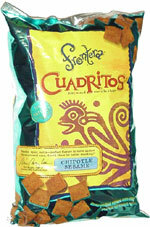 Taste test: These are small, square-shaped tortilla chips. 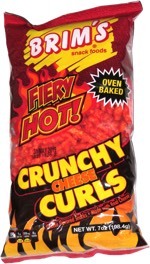 They taste kind of like Fritos, but with some very mild flavoring. I was expecting something hot when I heard "Chipotle" and saw the various kind of chiles in the ingredients. I don't see any sesame seeds. so they must be ground up. The taste is really not hot at all, and there's just a mildly hot aftertaste. If you can manage to dip these little chips into salsa without getting salsa all over you're fingers, they would good dipping chips. Smell test: Good tortilla chips smell, with some spices. From the package: “They're Enticing, these Little Squares. Sweet-earthy tortilla 'chiplets,' you might call them, shot through with the perfect flavors to jump-start a rockin' party, to spark an intimate conversation, to scratch a pesky snack itch.” ... “Ingredients: Stone ground yellow corn cooked in water with a trace of lime, corn oil, Chipotle chili powder (imported paprika, ancho chiles, mild New Mexico chiles, garlic chips, cumin, Chipotle chiles, Mexican oregano, coriander, cloves), sesame seeds, salt."